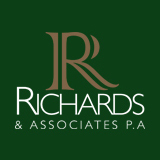 Richards & Associates, P. A. If you need legal assistance in Florida and are looking for the “gold standard” — Richards & Associates P. A. has been recognized as an AV® rated law firm by Martindale-Hubbell, the highest such rating available to any law firm. There are two components to each Martindale-Hubbell Peer Review Rating. The first letter is the Legal Ability Rating. “A” corresponds to “Very High to Preeminent”. The second letter is the General Ethical Standards Rating. “V” corresponds to “Very High”. Since 1991, the Firm grew from a sole proprietorship to today’s team of corporate, tax and real estate professionals dedicated to personalized client service and the highest quality of work product. In addition, we currently offer clients a menu of complimentary services through its divisions and subsidiaries. Richards & Associates P. A.’s practice is international in scope with the strongest connections in Latin America and Europe. All attorneys and staff members are fluent in Spanish. Attorneys at our Firm also speak French, German, Hindi and Portuguese. The Firm maintains membership in global professional organizations to gain immediate access to competent attorneys in jurisdictions worldwide. The Firm is a member of the Integrated Advisory Group (“IAG”), a global association of attorneys and accountants. In addition, The Firm is a member of the International Bar Association, the Inter-American Bar Association, the Society of Tax and Estate Practitioners (“STEP”), the Florida International Bankers Association and others. These affiliations facilitate the Firm’s access to high quality legal advice and current legal developments worldwide.